The head of the world’s top footballing body, Sepp Blatter, arrived in Burma yesterday to promote the sport in the military-ruled country amid criticism that his visit supported a sanctions-listed business tycoon. Blatter, who has held the FIFA presidency for 13 years, yesterday opened a football academy in Mandalay, and today met Burmese President Thein Sein. He has also met with Zaw Zaw, chairman of the Myanmar Football Federation (MFF), who said the trip was “essential for the development of our football standard”. But that meeting is likely to attract criticism: Zaw Zaw is owner of the Max Myanmar company and Ayerwaddy Bank, as well as a multitude of other business interests. His strong connections to the Burmese junta have meant that he, his wife and his businesses are on US and EU sanctions lists, which Switzerland, where FIFA is based and where Blatter is a citizen, is subject to. Blatter told a press conference in Rangoon yesterday evening, prior to his meeting with Thein Sein today, that he had “a very good impression on Myanmar [Burma] and people in the country are very nice”. As well as the Mandalay academy, FIFA will also fund a ‘Goal Hotel’ – essentially a headquarters for the MFF – in Rangoon and a stand at the Thuwunna stadium in Rangoon. 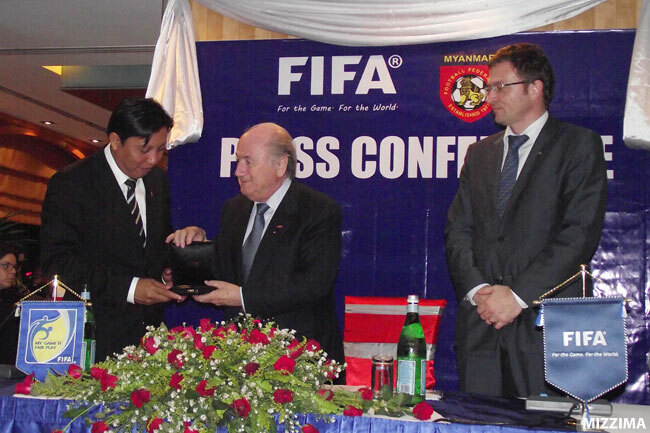 The MFF’s media director, Soe Moe, told DVB that Blatter had been invited to Burma by Zaw Zaw when the two were at the World Cup in South Africa last year. Zaw Zaw has been specifically implicated by the Thailand-based Karen Human Rights Group (KHRG) in the forcible confiscation of land in Burma’s eastern Mon state in 2008 for use as rubber plantations. When questioned by DVB about Blatter’s interactions with a sanctions-listed individual, Thomas Graf from the Swiss Federal Department of Economic Affairs (FDEA) said the MFF “is not listed and therefore not subject to Swiss sanctions”. But Alex Stone, press officer at FIFA, told DVB that the organisation’s statutes “are very clear: the running of football organisations has to be autonomous from governments”. 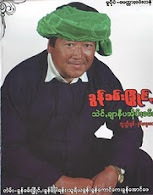 US perceptions that Zaw Zaw has provided “important services” to the Burmese junta call into question whether he, and the MFF, contravene the statutes of FIFA. Under Blatter, the footballing body has been no stranger to controversy, with regular accusations of bribery and corruption emerging in the press and a criticised trip to Sudan last year. The world of FIFA revolves around votes from representatives of its 208 member nations – analysts suspect that Blatter is now in the stages of seeking favourable votes from members to see off an attempt to unseat him as FIFA president, accusations that Blatter attributed to the “evils of the media”. Football is by far Burma’s most popular sport, with huge viewing figures for televised English Premier League matches in particular. Last year, leaked US cables revealed that junta chief Than Shwe, whose grandson plays for Delta United, formerly owned by Zaw Zaw, considered buying Manchester United for somewhere in the region of $US1 billion while the country was still reeling from the devastating cyclone Nargis. Instead however the senior general sufficed with creating an indigenous league, which the cable suggested would also act as suitable distraction for a disenfranchised population. Meanwhile, days before Blatter’s visit, Burmese fans pelted opposing Indian players with stones and other missiles in Rangoon as the two teams met in a pre-Olympic qualifier, with limited security. Footballing website Goal.com described the event as “one of the worst displays of hospitality and hooligan behaviour at its best”.